Why See The Light in the Piazza? Grammy award winner and Tony nominee Renne Fleming stars as Margaret Johnson in The Light in the Piazza! The internationally renowned musical by Craig Lucas and Adam Guettel heads to the Lyric Opera in Chicago for a strictly limited 10 performance run! Fleming will debut in the role in London before heading to Chicago just in time for the holidays. 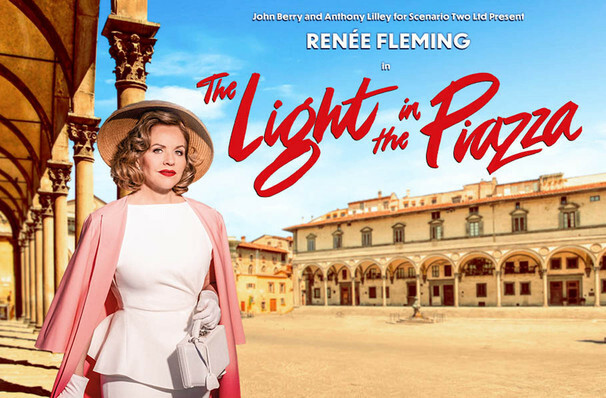 Debuting on Broadway in 2005 The Light In Piazza received much critical acclaim for its immensely romantic score. The production went onto win Six Tony awards including the award for Best Original Score. This 2019 revival is directed by Olivier award-winner Daniel Evans. Featuring the Lyric Opera Orchestra, be prepared to be swept off your feet with this gorgeous musical! What is The Light in the Piazza about? Set in Florence in the summer of 1953, American Margaret Johnson and her daughter Clara take in the sights and sounds of their surroundings. When a gust of wind carries Clara's hat across the square and into the hands of Fabrizio Naccarelli a romance between the pair ensues. But as Clara's and Fabrizio's love deepens, secrets begin to surface as it becomes clear that there is more to Clara than meets the eye. Seen The Light in the Piazza? Loved it? Hated it? Sound good to you? 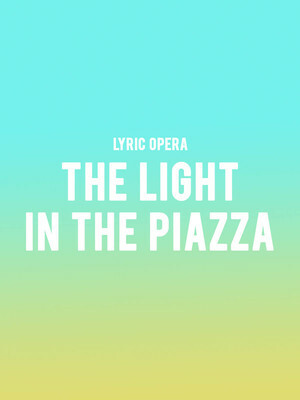 Share this page on social media and let your friends know about The Light in the Piazza at Civic Opera House. Please note: The term Civic Opera House and/or The Light in the Piazza as well as all associated graphics, logos, and/or other trademarks, tradenames or copyrights are the property of the Civic Opera House and/or The Light in the Piazza and are used herein for factual descriptive purposes only. We are in no way associated with or authorized by the Civic Opera House and/or The Light in the Piazza and neither that entity nor any of its affiliates have licensed or endorsed us to sell tickets, goods and or services in conjunction with their events.